traits -- white dot, fat legs, pale head. the lure of its wild singing. From Odd Mercy (Headmistress Press, 2016). 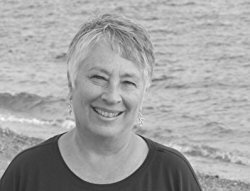 Gail Thomas is the author of four books of poetry, one of which, Waving Back, was named a ?Must Read for 2016” by the Massachusetts Center for the Book. Her most recent collection, Odd Mercy, explores a difficult mother/daughter relationship that is further complicated by the mother's dementia. Gail lives in Western Massachusetts, where she works as a learning specialist and teaches at Smith College. Learn more about her at gailthomaspoet.com. That last line is so memorable, wow! Great poem. Especially like the last line. A beautiful and concise poem. Thanks. Absolutely beautiful Gail. The. Last line blew me away! Thank you. For some reason Jayne's introduction reminded me of 'The White Tiger' by Aravind Adiga; it reminded me how animate we are.